Shortly after his Saturday night TKO win over long-time middleweight contender Ronaldo “Jacare” Souza, 26-year-old New Zealander Robert Whittaker called out divisional kingpin Michael Bisping. “You owe me a fight, man,” he said, referencing a bout that was scheduled for a brief stretch in 2015, but was unfortunately scrapped when Bisping sustained an injury in training. Whittaker might be right. Bisping did pull out of their previously scheduled fight, and as such, he could be argued to owe him one. The real reason for this callout, of course, is not because Whittaker believes he’s been shorted on a fight with Bisping. He, like all of his middleweight peers, wants Bisping’s middleweight belt, and is doing what he can to leverage the opportunity to fight him for it. Unfortunately, Bisping is currently penciled in for a title defense against former UFC welterweight Georges St-Pierre, a man who has never fought at middleweight before, and has not stepped into the Octagon for nearly four years. So, much to the chagrin of the many deserving contenders in the middleweight division—Whittaker included—any shot at Bisping’s belt will have to wait. This means that Whittaker will either have to take another fight in the meantime, or wait around twiddling his thumbs. Given that no fight means no paychecks, we can expect the young Kiwi to pick the former option. So, if not Bisping, who does he fight next? Romero is probably the only man in the middleweight division who is more deserving of a title shot than Whittaker. The former Olympian has done everything one can possibly do to earn a title shot, and yet he was deprived of the opportunity when the UFC opted to cash in on a Bisping vs. St-Pierre title fight. As such, he finds himself in the same uncomfortable boat as Whittaker, faced with the choice to wait or fight. Romero has flip-flopped on this choice. For a moment, he seemed to be interested in a possible time-killing interim title fight with Anderson Silva. Since then, however, Silva has turned down the fight, and Romero has stated that he’s keen to wait for his crack at the winner of Bisping vs. St-Pierre. Yet even if Romero does decide he’s willing to keep himself busy against someone like Whittaker, this is just one of those bookings that doesn’t seem to make sense. In Romero and Whittaker, we have two endlessly compelling challengers for the middleweight title. Why waste one by pitting them against each other? Anderson Silva is looking for an opponent. Originally, he was expected to take on the streaking Kelvin Gastelum at UFC 212 this June 3, but this plan fell through when Gastelum became the latest casualty of the United States Anti-Doping Commission’s regressive anti-marijuana legislation. While Silva is stationed some distance below Whittaker in the middleweight division, he is the greatest middleweight of all time, and as such, would make an interesting test for the young Kiwi. The problem with this potential fight, however, is that Silva only seems to want to fight Nick Diaz. He wasn’t interested in Yoel Romero, Luke Rockhold, Vitor Belfort or Uriah Hall. He’s probably not going to be interested in the streaking Whittaker. In a few short weeks, on the undercard of the absurdly stacked UFC 211, 19-1 Polish contender Krzysztof Jotko will welcome former two-division world series of fighting champion David Branch back to the Octagon. The winner of this fight will likely emerge as one of the hottest names in the middleweight division, and will probably have earned a fight with a member of the division’s top-5. Even in victory, however, neither Branch nor Jotko will be on Whittaker’s level. At this juncture, Whittaker has simply accomplished far more in the UFC middleweight division than either man, and so his taking a step back to fight the winner of their UFC 211 fight just doesn’t make sense. At a glance the streaking Gegard Mousasi, who recently authored an important if controversial win over former champ Chris Weidman, is probably the most logical choice for Whittaker at this point. In slightly different worlds, both middleweights could probably be gearing up for title fights as we speak. Both are on impressive win-streaks, highlighted by stoppage defeats over other top contenders. They’ve even exchanged a bit of trash talk in the past. The glaring problem with this fight, however, is that Mousasi’s future employ with the UFC is uncertain. The Dutchman recently became a free agent. Given that he has long felt undervalued by the UFC, and the fact the Bellator was just given the green light by deep-pocketed parent Viacom company to sign any and all high profile free agents, its entirely possible that Mousasi’s next fight is not in the Octagon. Last June, Luke Rockhold surrendered the UFC middleweight title to Michael Bisping, succumbing to first-round punches in one of the year’s biggest upsets. He’s been trying to get back on track ever since. Unfortunately, the UFC’s only attempt at booking him a comeback fight—a briefly scheduled November fight with Jacare—fell through when he sustained an injury in training. Today we know that Rockhold is healthy and ready to accept a fight. 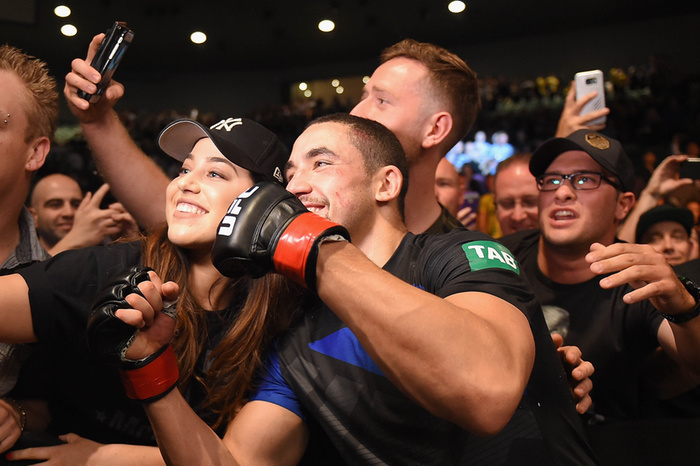 With Silva not interested in being his dance partner, Romero keen to wait for a title shot, and Mousasi on the free agent list, there is no better option for the former champ than Whittaker. Rockhold seems to be very aware of this fact himself, having recently told Ariel Helwani that it’s a fight he’d be interested in setting up for UFC 213 this July 8. From a rankings perspective, it makes sense. From a scheduling perspective, it makes sense. From an entertainment perspective, it’s bulletproof. Whittaker and Rockhold would almost certainly produce a fun fight, and so there seems like no reason not to book it.